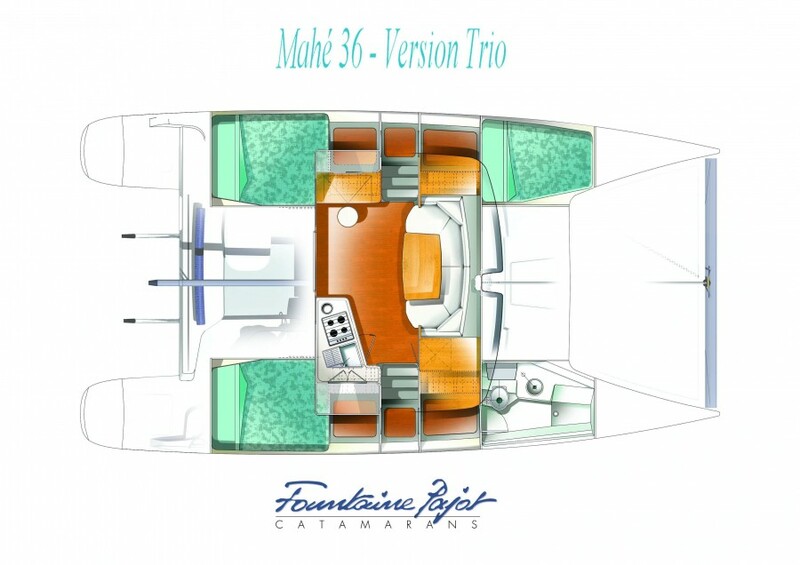 One is immediately impressed with the Fountaine Pajot Mahe 36’s proportions. The cabintop is not too high or big, and bridgedeck clearance is not too low. The hulls are tall enough to provide excellent interior volume without looking overblown. The two-person helm seat provides good visibility over the coachroof, and several comfortable seats in the cockpit provide excellent views forward through the saloon’s large companionway doors and wrap-around windows. Storage on deck is good. A single locker in the cockpit can accommodate lines and fenders, and a larger foredeck locker will swallow extra deck gear. The traveler, which runs the full width of the stern on the aft crossbeam, provides good mainsheet control, and both jibsheets can be trimmed from the helm station. The owner’s cabin to starboard has a large queen bunk aft and plenty of stowage space in cabinets, drawers, and a hanging locker, plus access to another large storage locker farther forward in the hull. An opening hatch and opening ports provide plenty of ventilation. The entire starboard bow is dedicated to a head that’s bigger than heads I’ve seen on some 60-foot monohulls. The entire accommodation area is accented with stylish light varnished-wood furniture and a parquet cabin sole. The saloon has all the light, space, and seating you’d expect to find on an offshore cruising cat, though it’s a little narrower (fore and aft) than a bigger cat’s saloon would be. The galley and the nav station in the saloon are more than adequate. The chart table has a seat, and the galley has decent counter space plus a handy window for passing drinks up to the helm. In twelve to 15 knots of wind speeds can be consistently in the 7-knot range, and the Mahe will tack through about 95 degrees. The feedback from the helm was workable, and the boat does not require lots of subtle helm adjustments to keep the telltales flying straight back. The helm station is comfortable, and the ability to trim both jibsheets from the helm station is a plus. Under sail, this is a good little performer that doesn’t feel little when you’re under way. As with any twin-prop boat, performance under power doesn’t provide any surprises. Even in a pretty stiff crosswind, one is able to back into a slip without much difficulty, and the engines don’t have to work hard to push the boat along at an easy 7 knots. Under sail, the boat performed well. Fountaine-Pajot’s designers achieved excellent headroom and plenty of elbowroom in both the saloon and the cabins without sacrificing proportion or performance. This is a 3-cabin version, with a stunning amount of space in 36 feet. Comfortable saloon and cockpit areas, with spacious and private cabins in the hulls.